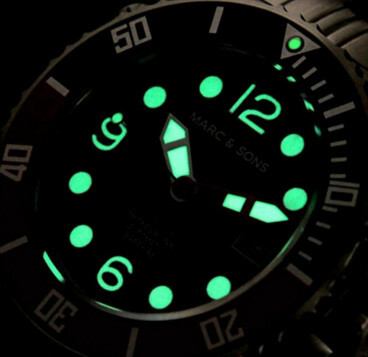 Always on the lookout for affordable Divers watches, I was pleased to come across this offering from the German brand Marc & Sons. They usually deal exclusively from their online shop and pride themselves on value for money with this direct approach. Casting my eye over their range I liked this one as it manages to show a classic look with no frills, a good specification and good value too. This is the Marc & Sons Professional Automatic Diver model 300 M MSD-033 in Stainless Steel. Strong luminous hands and markers, plus clearly defined datum bezel marker. The Miyota 8215 movement I suppose is a real workhorse and one of the most robust on the market, albeit not as refined as the ETA 2824-2 and it is NOT hacking, but personally this omission doesn’t cause me a problem. 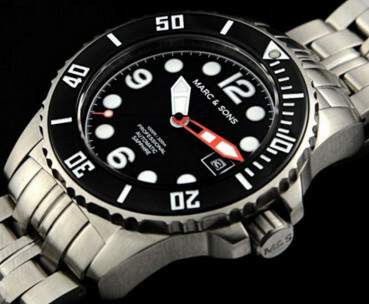 It’s still a good all round and solid performer and ideal for the Diver’s purpose. The power reserve on the Miyota is better than the ETA at some 45hrs and accuracy wise it’s fine for the job. I like the dial layout with the broad hands and combination of numerals, markers and color touches works just fine. Also impressive is the Dot second hand, a feature I’ve always liked. Look at the night image and the dial clarity is something else, very good with no distractions at all. Others should really take note! A good 120 click single rotation black ceramic bezel with clear markings makes for a very practical watch and at 300 m Water resistance the Helium valve becomes a useful feature. Screwed Stainless Steel back , 300m Water Resistance and decent (Breitling like) bracelet, shows quality. The inclusion of a Sapphire crystal is a nice bonus and overall the build quality is pretty good, so in the end you get a decent amount for the very affordable price of around £183.00 and I’d certainly be happy with this as an addition to my little Diver’s collection. So one to watch – Marc & Sons and one that I confess I knew little off, so pleasantly surprised and good to see a solid performer at such a good price. Mind you . . . . . . . These days I look for the best possible value in Divers watches (my favorite Diver is the Apeks 200 m which I reviewed back in December 2013). However if you’re in the market for a deep water watch, this model will take some beating – with believe it or not, another Apeks – the 1000 m Professional Mens Divers model. Bargain Diver! 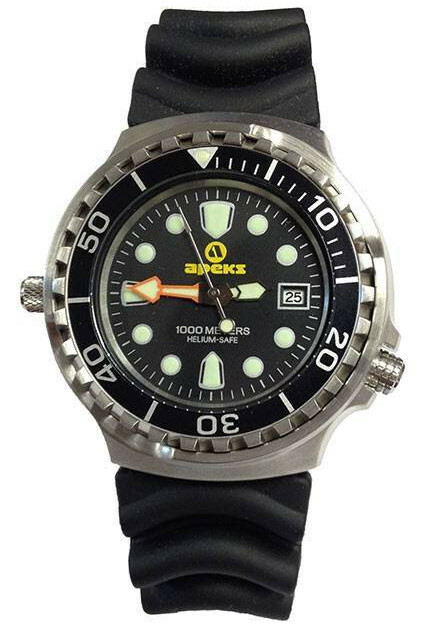 The Apeks 1000m Mens Diver. With a similar style to my older 200 m version this has a slightly heavier construction. In fact it has a bit of the Seiko Monster look about it and comes with a Helium escape valve that opens when the internal pressure is 4.5 Bar +/- 1.5 Bar higher than the external pressure. Also like the 200 m quartz powered and sports this time the Seiko-Epson VX42E date Quartz analogue movement. 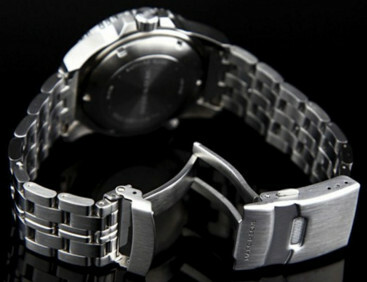 It also sports one of the better bracelets around – a Breitling-like solid stainless steel affair of excellent quality. Now OK this may not quite have the same quality as the Marc in absolute terms, but this has a custom built quality specifically engineered to meet practical criteria and is totally fit for purpose. I have to think that for a sheer “value to purpose” ratio, there’s not much around to challenge it. And once again this represents terrific value for money and available at the low price of £96.30 – and for that it just has to be a bargain! This entry was posted in Spotlight, Watch reviews and tagged Apeks 1000m, Marc & Sons, Miyota 8215, MSD-033 Professional 300m Diver, Seiko/Epson VX42E. Bookmark the permalink.